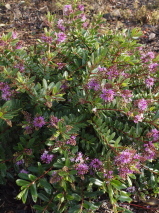 Rounded bushy shrub with purple branchlets. Dark green glossy oblong leaves are inclined on one plane, with a purplish midrib, it gives this dense shrub a very distinctive appearance. 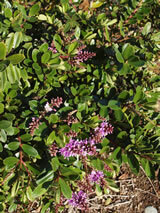 The purple flowers smother the bush and appear in spring over a long period. It will grow in sun or semi-shade, best in well drained soil, will grow in dry sites. Hardy to coastal and exposed conditions, avoid humid sites. A very tidy plant that clips well, and stays looking great for many years.